Aquaponic Systems, Are they for you? Posted 3:48 am by Chris & filed under Permaculture. Are Aquaponic systems right for your house or farm? As stated by Earth Solutions below, This is the definition for you for Aquaponics. I could not agree more. Aquaponics is an innovative production method that does not require the fertilizers, costs or labor associated with in-ground gardening. Farm in a Box Aquaponics tells this story by re-creating natural ecosystems between plants, plants and friendly bacteria to produce delicious organic vegetables and fish. Fish waste from the fish tank is transported up to a plant bed (the bog) where plants are housed in rocks, rather than soil. The fish waste (ammonia) is produced by fish, becomes organic fertilizer. Plants and friendly bacteria, living on the rocks, make this happen and simultaneously purify the water by removing ammonia. Naturally cleansed water then filters back down into the tank, making it unnecessary to change the water or use a filter. The cycle repeats itself every 1-2 hours on a timer. When Aquaponics transports fish waste to the plant bed(s), chemical fertilizers are replaced with organic fish waste. The nitrogen and water of the fish tank are no longer thrown away, instead they feed the plants. Likewise, the friendly bacteria that naturally colonize in the rocks in the plant bed, neutralize the ammonia from the fish waste, purifying the water naturally. 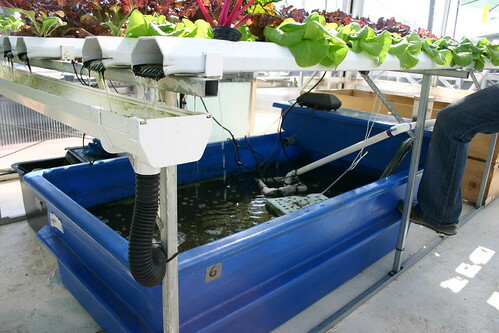 Overall combining hydroponics and aquaculture into Aquaponics conserves water, re-uses ammonia and nitrogen, and eliminates the need to chemical fertilizers.